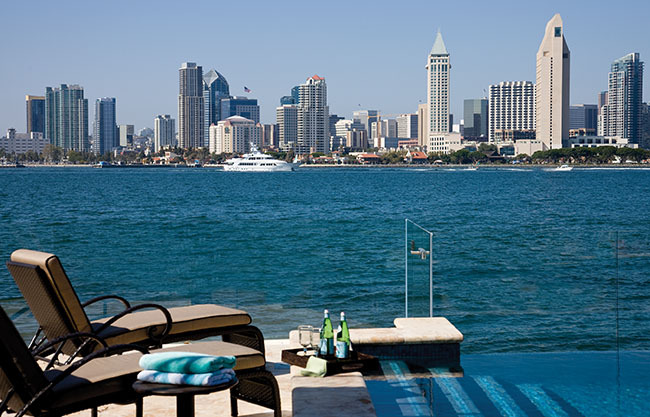 In early spring, while frigid temperatures keep much of the nation indoors, Coronado is blessed with an enviable climate that invites outdoor living all year. Here are five examples of how Coronado families have created outdoor living environments for maximum enjoyment. See if some of their ideas might provide an impetus to transform your own underutilized exteriors into special places to escape or to gather with family and friends for fun and games. A large conversational seating area that surrounds the fireplace and an oversized central ottoman are perfect for entertaining. Soft blankets draped about enhance the warmth of the fire on chilly nights or brisk days, and a rock fountain built into the corner fills the space with tranquil babbling sounds. 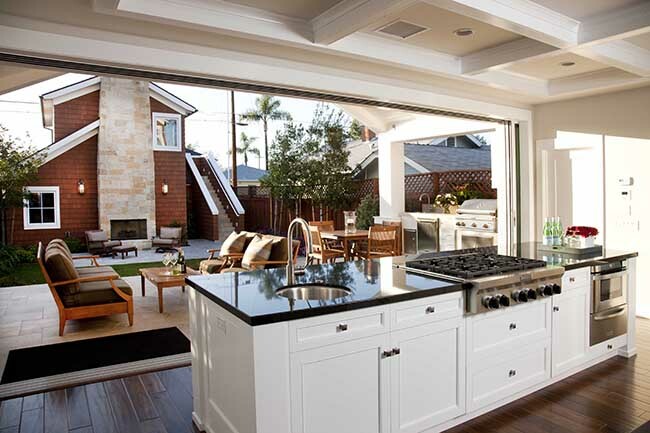 The barbecue, outdoor refrigerators and serving area were built close to the house to allow easy access to the kitchen, making it an effortless extension of the indoor living space. Lush palms planted about complete the casually elegant beachy feel. Because of the way the patio is angled off the kitchen, making a cup of coffee in the early morning comes with a view of the sunrise in the east, while sunsets cast a rosy glow along the coral stone patio floor. The balcony off the master bedroom above shelters the patio from some of nature’s brisker breezes. 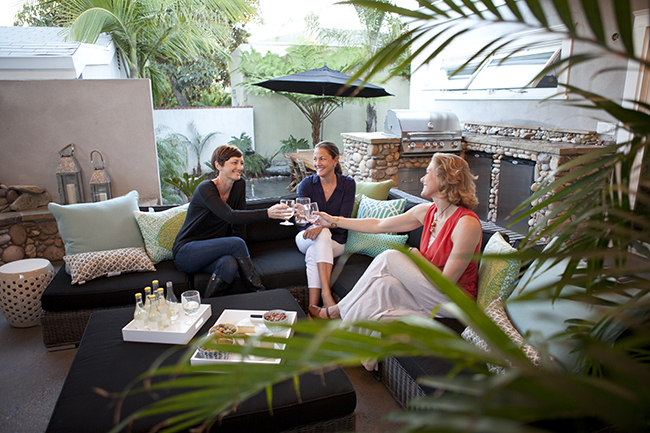 Utilizing the natural elements and beauty of an outdoor space really maximizes both its form and function, as evidenced by the home’s certification as a LEED Gold house — the first home to be so designated in Coronado. The LEED Gold award, (Leadership in Energy and Environmental Design) is a prestigious and difficult stamp of approval to obtain, and signifies a building’s “green” status through such elements as sustainable materials, partial solar heating and radiant heat. “My life in the desert involves managing a huge orthopedic group and can be very stressful,” said orthopedic surgeon Steve O’Connell. “On weekends, when I drive over the big blue bridge and head to our house on I Avenue, the stress melts away -— our home here has become a true escape,” he said. The O’Connell house, designed by architect Christian Rice, sits on a small plot of land (35 feet in width and 140 in depth). The challenge, Rice explained, was to create a space that would feel open and expansive despite some size restrictions. The solution was to create a great outdoor room directly off the kitchen with a disappearing wall to the outside. Said O’Connell, “Even though we are outside, it feels like we’re in a living room. 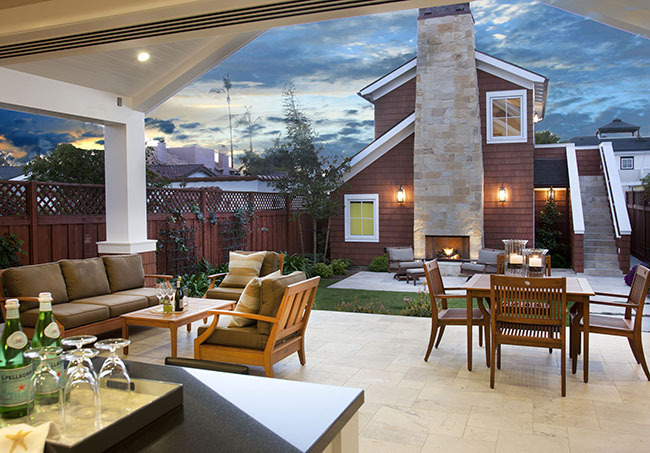 Marble flooring, accented with plush furniture and a big roaring fire in the outdoor fireplace ties the outdoor space in with the inside. It makes what would otherwise feel like a tight indoor space feel big and open.” O’Connell, and his wife, Jean, do most of their entertaining in the kitchen, so the windowed walls that disappear into pocket doors create a continuum — people can sit inside at the kitchen island, at the bar, by the fireplace, or near the grill, and no one is separated or isolated. 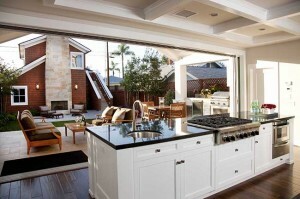 The outdoor living room and barbecue area in this B Avenue home was inspired by its proximity to the beach. With a fireplace made from rocks and shells collected by the homeowners’ children (inset) and a roof for those rare rainy days, the space is comfortable year-round for gatherings. A paved corner of Scott and Meridith Metzger’s backyard was transformed into an outdoor dining area with the addition of a pergola and electric hanging lanterns. 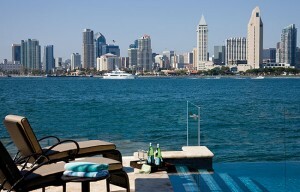 The color of the pool was chosen to blend with the bay at Bella Vista on First Street. A glass wall helps maximize the view. A disappearing wall creates a seamless transition from indoors to outdoors, expanding the living space in this narrow lot. 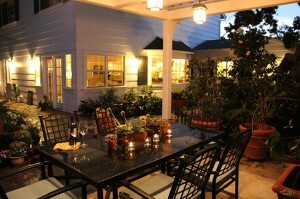 “The open space makes it always feel party ready,” said Steve O’Connell, the homeowner.